(2018). Central Asia – a region of rich cultural diversity, heritage and ancient traditions – is also one of the most dynamic economic regions in the world. 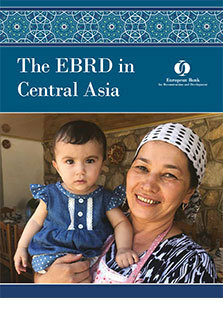 This brochure, prepared for the Central Asia Investment Forum in Beijing in November 2018, demonstrates how EBRD’s investments, technical assistance and policy dialogue are making a real impact in the countries of the region – Kyrgyz Republic, Kazakhstan, Mongolia, Tajikistan, Turkmenistan and Uzbekistan. A wide selection of case studies shows how the Bank is making these economies competitive, well-governed, green, inclusive, resilient and integrated.